Like many, I tend to be an emotional eater. And dog-gone-it, if I want a fried egg, I want a fried egg. And no amount of seasoning of French name-calling will sufficiently entice me to mentally switch from the envisioned savor of a fried egg to settle for an omelet made from powdered eggs. Yes, this certainly is a problem if I find myself completely out of real, honest to goodness eggs! Powdered eggs and other egg substitutes are great for baking and such, but there’s just nothing else that compares to a real fried egg, over medium--not to mention the fact that it's also been impossible thus far for me to make my sinfully delicious cream puffs with any of the substitutes. So, not one to leave something as important as a hankering for a fried egg to chance, I’m happy to say that there’s a great alternative to powdered eggs or “egg substitutes. I’ve previously written in great detail how to preserve your real eggs without refrigeration—yet another reason why I’m certain that the folks at the local extension offices hate me fiercely—but I realized recently that I haven’t written about my favorite method of preserving eggs. Thanks once again to my farmer friend for sharing this with me some time ago. It really easy actually, all you need is some good ole fashioned mineral oil, your eggs and cartons, and preferably a pair of food handling gloves. 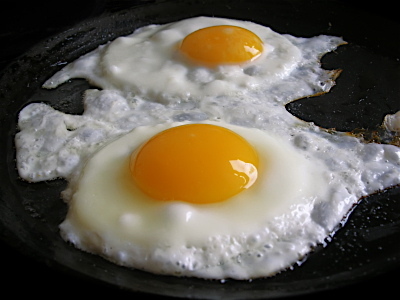 All you’ve got to do is warm up the mineral oil slightly (it spreads easier) and slather it all over your eggs. 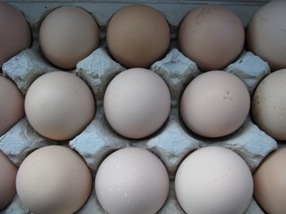 Put your eggs back in the carton, with the narrow tip facing downwards, and then store them in a cool, dry, place. As an added measure for taste and texture, flip over the eggs every 30 days. You see, when eggs come out of the chicken they naturally have a coating which enables them to last at cool room temperatures for long periods of time. When you purchase eggs from the store, that natural coating has been washed off and the eggs have been sanitized. When you replace the coating with mineral oil you’re essentially mimicking what Mother Nature did in the first place. Mineral oil is easily found in your pharmacy section of your grocery stores or more specifically in the digestive aid section of your pharmacies. If you accidentally get part of the shell in whatever you’re making, it’s no problem. A little mineral oil won’t hurt you one bit, and a lot will simply clean you out good! You don’t absolutely have to warm up the mineral oil, but warming it for 10-15 second in the microwave on high will help it spread more evenly over the eggs. I like to use the thin plastic food handling gloves because the slimy feeling of the oil bugs me after a while. 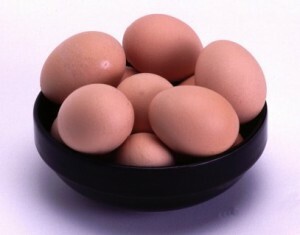 A quarter cup of warmed mineral oil will take care of about 6 dozen eggs. Using this method you can take advantage of great sales on eggs without having to worry about how much room you have left in your refrigerator. This method will enable you to have whole, real eggs for 9 to 12 months past their expiration date. Yes, NINE to TWELVE months without refrigeration. You can use this method on fresh eggs or store-bought eggs. Obviously the fresh ones are going to last longer than the store-bought ones. How do you know when you’ve got a bad egg? Well, your nose will be certain to tell you in an unmistakable manner. I’ve only had one bad egg in all the time I’ve done this. And just in case you’re wondering, one bad egg in the carton does not mean that the rest of them have gone bad—just the one that smells horribly. It doesn’t matter which kind of egg carton you use, cardboard or foam, although I like the foam better if I had a choice, because I picture the cardboard absorbing my mineral oil. Of course such an issue, if valid, could be rectified by lining the cardboard cartons with plastic wrap. But after trying that a couple of times and finding no difference between the plastic wrapped dozens and the non, I gave up on that extra step. The downside to this method is that you won’t be able to make traditional egg white dishes such as meringue which requires absolutely fresh egg whites. But otherwise, any time you want some fried eggs with your bacon or as the basis of your fried egg sandwiches, you won’t have to sacrifice taste or texture one iota. Now suppose you’re one of those readers who reads what I have to say just so that you can tell the rest of the world how absolutely crazy I am. Instead of derision, why not give it a shot and try it? Mineral oil is cheap enough. If all you did was try it on one egg in a carton you might find that I’m right on the money on this one. You may also discover that you’ve just made a heck of a lot more room in your refrigerator with this method and found a way to save tons of money on that overpriced powdered stuff that’s sold out of fear. Just as an aside, another not-so-well known substitution for eggs in your baking is actually clear gelatin. 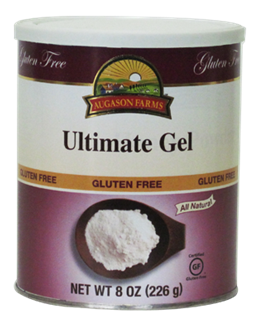 I purchase the “Ultra maxi gel” from Augason Farms when it goes on sale. (It's SO much cheaper than buying box after box of those tiny Knox Gelatin Brands) Just one of these bags is equivalent to 10+ dozens of eggs for the purposes of baking. And you know how I love my multi-purpose items. This strategy saves me money on using the expensive powdered stuff and also serves as a nutritional supplement and a thickener for sauces, jams, and much more. A special thanks to my farmer friend who doesn't mind my peppering him with questions all the time, even if it's something as insignificant as asking him why he keeps his fresh eggs on the counter all the time! It was just such a question that turned me on to this method. Don’t you just love having egg-actly what you want when you want it without having to blow your budget? Be sure to check out the other articles I've written on this topic. Enjoy! I love, love, love this tip that I learned from you awhile back. I currently have quite a stash of eggs. I was lucky to find an unadvertised special of 50 cents a dozen and I stocked up confidently knowing that they would last because of this one little tip. Thank you!!! I know what you mean. I either get, "What a great idea!" or 'that look.' I know they're thinking I'm crazy. Up north in the wilds of Canada, we would wax eggs to keep eggs for months. I have a traditional irish cook book that says the farmers would butter their eggs before going to market. I imagine it was for keeping their eggs fresher, longer! I wouldn't use butter now (too expensive!) but I do have some mineral oil on hand and I'm putting this to the test. Thanks! Wow!!! I had no idea about the eggs. THANKS!!!! My question is: Since I live in the South and we have a tendency to lose power with the powerful storms that roll through, how warm a temperature can the eggs stand before they go bad? Sometimes it is days before we get our a/c back. That's not definitive, but look at it this way. They sit out in the heat underneath the hens a while each day. My personal cool target is between 68 and 72 degrees. Again, if they go bad, your nose will definitely tell you. You can also use the "float test" for the eggs. Put the ones you are going to use in water. If they float to the top, they are bad. They are still good if they do not go all the way to the top. Very interesting Kellene! As usual you have given me something to think about. Now, my question is....I have chickens.....do I need to use mineral oil on the fresh eggs straight from Mama Hen that I have NOT washed off? How long would they last if I did nothing I wonder....????? they won't last months and months without washing them off, but they will last quite sufficiently just on your kitchen counter without having to put them in the refrigerator. I haven't found any farmers sharing with me that they will last 9 months without some kind of additional treatment. A couple of things. First, I would not do any type preservation of this type on store bought, cleaned eggs. The outer protective layer has been removed and the slightest contamination could get into your eggs. The second thing is that this type preservation can be done with "water glass." A gallon of water glass will preserve a lot of eggs for a long time. This was what was often used before refrigeration. Water glass is actually a cement floor sealer. It is not very readily available, but it is available on Lehmans.com on the net. Water glass $19.95 plus shipping although it is a viable option. Mineral Oil $2.49 and has never failed me. Considering I've probably done this to more eggs than the majority of my readers put together, I'd say it's viable as well. this is awesome! would another type of oil work as well? or does it have to be mineral oil? other "oils" are likely to go rancid. Mineral oil is cheap so I wouldn't take any chances. I did purchase some powdered eggs but the thought have having real eggs lasting this long is truly amazing. I will give it a try. Thanks for all the wonderful information. I did this last year with eggs and after 6 months, some went bad. When I cracked open those that looked good, I found the egg runny as if the oil soaked in and 'liquified' my egg. It wasn't nice and firm like a fresh egg. And my cheese after many coatings started to ooze. My basement temp is between 57 and 65, depending on the season. I had my cheese hanging in nylon stockings. Does that put stress on the wax? Your eggs do become more runny over time--Which is why I always warn that you can't use the egg whites for making meringues. You can't possibly put enough oil on the outside of the eggs to have the impact that you're suggesting. Just this month I've used eggs at the 9 month mark. No problem whatsoever. I've found that the flipping them monthly makes a big difference. Again, every time I see a problem with cheese waxing, it's because folks are getting their methods from someone else and key components are missing. I then get to hear about it AFTER the fact. *sigh*. I've even seen misinformation from prominent cheesemaking sites--because they aren't experienced with working and preserving existing/common store bought cheese, rather they are preserving the cheeses that they have made, which will inherently have significantly less moisture in them (because they aren't plugging the cheese full of more water just to make more money when selling it by weight) and they aren't typically storing their homemade cheeses in the refrigerator (rather caves or cellars or room temperature) and then waxing it. I've seen some dingbats actually tell people to freeze their cheese first and then wax it. That is wrong on SO many levels, not the least of which is common scientific sense. Gee...what's going to happen when cold cheese meets hot wax? They are going to repel and cause an air pocket and swelling, ere go you get oozing. in No, cheese is commonly hung. If you're using a quality cheese wax, it should move with the cheese. And cheese also needs to be shifted occasionally due to gravity. Like Donna, my cheeses oozed out on the floor of my cold food room. (Which is carpeted, and the "ooze" was a pain to get out of the carpeting.) I examined the wax on all of the blocks, and there were no holes. I had the blocks cradled in cheesecloth slings hanging from the ceiling and made sure they were free-hanging without contact to any other block. When I cut into them to use, a lot of oil poured out also. Now I bottle/water-bath seal my cheeses - even cream cheese in half-pint jars and even though the cheese gets a little stronger, they are perfect in every other way. My sister got the directions from gal who lives in the Australian bush and has no reliable electricity source. Storing the cheese on a flat surface is not recommended. You need air flow which is why I hang them and adjust them periodically. Sounds like your cheese either didn't pass the thumb press test and had too much water in it or it was too cold when you waxed it. A lot of folks are "bottling cheese." I'm definitely planning on trying it with cream cheese, but have not found enough reliable research to start on it yet. Kellene, I have your directions for preserving whole eggs in fine salt. This method seems easier. Have you found one way preferable over the other? I too have chickens. Should we wash the eggs (guess this means a rinse off in tap water) before using either method. I thought the natural "coating" would replace the mineral oil, but from your reply to Debbie, guess not. I prefer the mineral oil because it's much less expensive and faster. I don't wash the eggs from the store, but would if they were fresh from the hens. But now that I think about it, I'm not sure there's any reason NOT to wash them from the store, so I'll start including that in my process. It certainly won't hurt anything to do so. In preparing store bought eggs or fresh eggs, would you think the difference in the tecture of the eggs after months could be due to where we all live? I live in NC and we have some humid months. Farher south would mean more humidity. humidity always plays a role in the preservation of food and its nutrients and texture. I too had some REAL stinkers in the eggs....But I didn't know to turn them over once a month till they were coated for about 4 months. Then they started to ooze. But about 3 dozen did survive!!! I'm in learning 'cuz we have some new 3 wk. old chicks & I wanted to know what would work. I will be using this method & turning again...Thanx Kellene. All my 5- 1 lb. blocks of waxed cheddar went STINKY BAD. They were suspended in a cool closet in open mesh bags. Donna, I agree with you, I believe the stress caused the ooze of the nasties. Again these things were all faults of my own & lack of complete knowledge. Another reason I have to practice what is becoming a new life style. every single time I am shown cheese that went bad it's ALWAYS because someone has not complied with ALL of the guidelines. Cheese has too much moisture, isn't rotated, doesn't have enough thin layers of wax on it, etc. etc. etc. And no, the hanging of the cheese does NOT cause it to go bad. Think about that for a moment. How many Italian Deli's have you seen with cheese hanging in the window? You can also make your own powdered eggs by scrambling them and then putting them in your food drier until they are completely dry and then pulverising them in your blender and then sealing them in jars or can sealing them. Afriend told me about this and I am going to try it. i GOT MY MINERAL OIL AND I CANNOT WAIT TO TRY THIS METHOD OF PRESERVING MY EGGS.. THANKS FOR SHARING. I just flip the entire carton over, gently. Thanks Kellen. Flipping the carton over is so smart and easy. I'm glad I read all the entries and ran across your response on this question. Was getting this mental image of myself trying to turn each egg individually and winding up with more on the floor than in the carton. Easy fix! We have chickens and have had eggs on our counter for about 8 weeks without going bad. We don't wash them until right before we crack their shell. For store bought eggs, check for cracks before you coat them. Hold them up to a light bulb to see if there are any cracks. I do crafts with eggs and was amazed at the number of tiny cracks in store bought eggs. 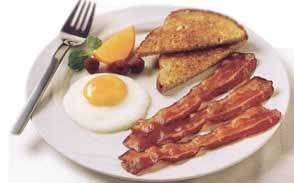 That may account for the runny eggs or those going bad quicker than other. I wish I was employed so I could buy extra food and get it put away... I want to really try this soon! my mother thinks I crazy for wanting to put a garden this year! Even this late. But the ground is not dry enough to till. My son came home from his mission and told me that I did not have to refrigerate eggs because no one did where he had lived - Cambodia! Thanks for all of your efforts. I will be doing this! Thanks for re-posting this for us dummy's that couldn't find it through the archives. Sure would like the measurement of gelatin to egg ratio. Would like to try this substitute. I happen to have "beef gelatin" and can't remember why. My senior "moments" are becoming a problem for me. Again, thanks for sharing your "smarts"! The measurements will vary by brand/manufacturer and will be posted on the packaging. I haven't tried this with the eggs but will soon. Also, do you know that you can "can" bacon much cheaper than the store bought "canned in tin cans" bacon? I have tried it and it does work! The bacon comes out of the jar feeling and looking almost raw and soft. You can cook it in the microwave, on top of the stove (but don't turn it over until it has gotten slightly crispy or you will have bacon bits) or even in the oven. I read this at backwoods homes magazine. Enola Gay wrote the article - she does later say if you are canning it for long term storage use parchment paper instead of masking paper as the masking paper can break down after some time. Thank you for all your time and effort to educate us. Can you enlighten me what role parchment or masking paper (?-I don't even know what masking paper is) plays in canning meat? Karen, you roll the pieces of bacon up in the parchment paper and then put them in the Mason Jar and then can them. Your parchment paper is just a tad bit longer than your bacon pieces and just a tad bit wider. You place the bacon piece on it, roll it like a jelly roll. Hope that helps. Have you tried using soy flour to replace eggs in your baking? I tried that a few times but that was a long time ago. I believe it's 1 heaping tablespoon soy flour and 1 tablespoon water to replace an egg. No, I stay away from most sources of soy. The reason eggs should be refrigerated is to maintain quality--the egg white breaks down over time and goes runny, changing a grade AA egg to a gooey ooze that will work in baked goods or scrambled eggs in a pinch, but not an angel food cake or even a decent poached or fried egg. Aside from that, there is the possibility of samonella poisoning. This bacteria can be transferred from the hen into the egg, where it incubates at temperatures ranging from 40-140 degrees F. You cannot see, smell or taste the difference between a contaminated egg and a safe egg,so there isn't really any way to tell if the egg is safe. An egg costs less than 10 cents when it's not on sale--it's not worth the risk to my family to experiment. As for using gelatin as a replacement for eggs, it works fine. Just a note, however: Maxi-Gel is a starch while gelatin is protein-based:) I use Ultra Gel--it works better for just about everything. It's interesting to note that according to CDC records, salmonella became more prevalent SINCE the widespread use of refrigeration and commercialization of eggs. Thus refrigeration is no guarantee to avoid salmonella. Fortunately, since I can't get all of my food directly from the source, I drink diatomaceous earth daily as well as use anti-fungal and anti-viral essential oils. This is not because I don't refrigerate all of my eggs, Rather because I can't count on the USDA to care about anything other than prosecuting raw milk providers and thus I want to always protect my body from e-coli and salmonella. Ultra Maxi Gel is indeed a gelatin and that's what I mentioned in the article. Ultra Maxi Gel is different from Maxi Gel. Didn't realize this could be done with store bought eggs. I thought fresh farm eggs were the only way to go since store eggs have already been washed. I also thought you could only use "food grade" mineral oil. So what I can buy at the dollar store in the health & beauty section will work too? What about fresh duck eggs? I have a couple of ducks gifting me with eggs and I'd like to preserve them...can I? I have to say, I know nothing about duck eggs. I don't THINK they would be any different, but I'm just not sure. Worst case scenario you can coat them and keep them in your refrigerator. :-) All mineral oil from the pharmacy should be "food grade" due to it's purpose. Eggs you purchase at the local Farmer's Markets have also been washed or at least wiped off, removing the "bloom". Still, they were just recently collected and not washed in Clorox or inoculated. Thanks for the info on the eggs. Can you tell me what you recommend the basement temp be for storing the eggs? Have you considered the benefits of ground flax as an egg replacement in baking? I like to add it to my homemade breads and it seems to give them a pleasant, moist, springy texture. I haven't tried that yet, but I've heard nothing but great things about it. Do you mean that you can't preserve farm eggs that have been fertilized? We have roosters with our hens. I hear you. I love a fried egg and it isn't happening with powdered eggs, but I could help with scrambled eggs. They are great with cheese, onions, peppers, and sausage crumbles. The only powdered egg I can eat is from Shelf Reliance. Praying for your complete recovery, and mine! There are millions of pores in the egg shell. The mineral oil settles into them but is still there. I am excited to hear about being able to preserve eggs. However, 2 of my 4 kids have egg white allergies, so we frequently use Ener-G. However, I just found out that is made from corn, and my one year old is allergic to corn. I am very excited to hear about gelatine as an egg replacer. How much is used to replace one egg? Is there any recipe modifications? How does it do with gluten free cooking? One of my egg allergy kids is also allergic to wheat. Sorry for all the questions! Hello i have a ? I have roosters with my hens can i still preserve the eggs or not? Do you have to use 'mineral oil'? Would olive oil, or any other vegetable oil work? Not all other oils adhere properly to the egg shell. I use jojoba oil as a non-petroleum product alternative, or you can set them in a gallon jar full of sodium silicate aka waterglass which is another non-petroleum product solution. However, the mineral oil is by far the least expensive option. Hi Kellene! I just watched you on Doomsday Preppers, and I am duly impressed! I have recently started prepping and I found the bit on preserving eggs very interesting! I have chickens, and have often worried that we aren't using the eggs fast enough and sell them after a couple of weeks for fear they'll go bad! Thank you for the information! I would share something with you also; there are a few different ways to tell if an egg is bad, one is fill a pan with water, about twice as deep as the egg is tall, if it floats, it's likely gone bad. Another way to tell if its bad, put it up to your ear and gently shake it, if it sloshes, don't break it! It's rotten! Just a couple of ways to save your nose (and spare your home that God-awful smell!)! I would recommend being careful about putting an egg close to your ear and shaking gently, to see if it sloshes, indicating it's rotten. Occasionally a rotten egg will explode. I had a hen sitting the other day, and one egg didn't hatch. After a couple days, to make sure it wasn't a late bloomer, I picked it up, and it exploded. LOUD. I thought someone had shot our .22 rifle close to me. Scared the daylights out of me, smelled awful, and some splattered on me. Just a quick comment about the Ultra Maxi Gel. I was trying to find it on the Augusta Farms website and it isnt available. Do you know of another place to purchase it? I am interested in trying your method for eggs. I have purchased some egg crystals for certain things but would like to have the real thing, too. Thanks for all your info! I just double checked and it is on there. Just do a search for "gel" and you'll find it. It's in the gluten-free section. Hi Kellene. I am chiming in here on this egg preserving thing. Very interesting! I have put down 8 dozen fresh eggs in the past two weeks by coating them with a thin layer of lard. They are in cardboard cartons inside a cooler in the cold room. I will also turn them each week. Will see how they turn out in the winter when the hens slow down their production! I would like to ask where one usually stores these eggs, that have been mineral oiled. We don't have a basement. In winter, the house is heated, and in summer it is air conditioned. We do have a garage that we heat enough that things won't freeze. Any suggestions?? The back of the coolest closet in the home or under the bed in the coolest bedroom. I noticed more than one question about storing fertilized eggs that way. Only one comment was 'nope' but I didn't know if that was an answer to that specific question. We also have roosters. I've been mixing up the eggs, putting them into a snack bag and freezing them for when production is down. I would prefer not using freezer space. Is it a problem to store eggs this way if they have previously been refrigerated at the store? No. that's how I started out. What is the name of the meat company you use to buy meat in bulk. I cannot remember the name and since we now live in Texas they do supply this area. Thank you. It all depends on which state you're in. I'd do an internet search for your state. In terms of preserving it, I don't preserve my milk. Instead I make cheeses and butter with it and then preserve those things.